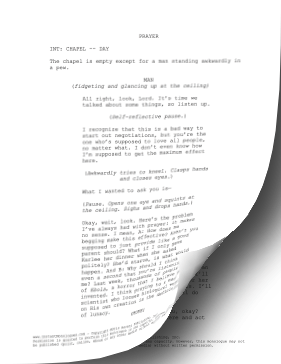 Intended for an adult male actor, this 4-5 minute monologue is great for dramatic auditions. The chapel is empty except for a man standing awkwardly in a pew. All right, look, Lord. It's time we talked about some things, so listen up. I recognize that this is a bad way to start out negotiations, but you're the one who's supposed to love all people, no matter what. I don't even know how I'm supposed to get the maximum effect here. Okay, wait, look. Here's the problem I've always had with prayer: it makes no sense. I mean, A: How does me begging make this effective? Aren't you supposed to just provide like a good parent should? What if I only gave Karlee her dinner when she asked politely? She'd starve, is what would happen. And B: Why should I think for even a second that you're listening to me? Last week, thousands of people died of Ebola, a horror that I believe you invented. I think praying to a mad scientist who looses biological warfare on His own creation is the definition of lunacy. I tried praying to you when I was a kid, of course. Then again, I prayed to Santa for all the same reasons, so you can see I was a bit fuzzy on the subject. You never did send me that new bike. Or the flamethrower. Or a sober father. But that's okay, Lord, because I've learned to do without. I've never needed a father much anyway. And I never had a problem standing up for myself. Let the record show that I've never asked you for a damn thing. My point is, she's a mother, and a wife, and a much better Christian than me. I know you take roll here, so I'll be coming to church every week for her and keeping up her Brownie points. I'll do whatever I have to. If you'll do this for me. So I am ask…I am telling you, okay? Quit screwing around up there and act like the sitcom dad you're supposed to be. Fix your mistakes. Make her better.